Algesal Suractive Pomad (Diethylamine Salicylate/Nopoxamine) is applied to the muscles, ligaments and tendons to relieve pain. Indications include pain that occurs as a result of joint problems and other musculoskeletal disorders, including rheumatic pain. Algesal Suractive Pomad (Diethylamine Salicylate/Nopoxamine) is applied to the muscles, ligaments and tendons to relieve pain. Indications include pain that occurs as a result of joint problems and other musculoskeletal disorders, including rheumatic pain. Diethylamine salicylate has analgesic (pain relieving) and anti-inflammatory properties. Topical application helps to provide effective relieve from the inflammation and swelling that occurs in patients with rheumatism, sciatica, as well as various aches and pains that can affect the body. Nopoxamine is a local anaesthetic which works by producing a numbing effect, so as to further improve the pain relieving benefits of this ointment. 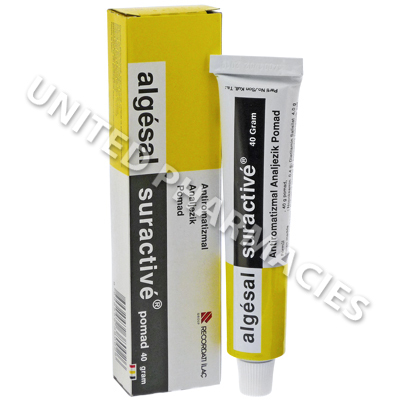 Algesal Suractive Pomad (Diethylamine Salicylate/Nopoxamine) ointment is intended for use on the area of skin at the site of pain. This helps it to act directly where it is needed and provide quick and effective relief of symptoms. Follow the administration instructions provided by your doctor. In most cases, adults using this ointment for pain will be instructed to apply it 1 to 3 times per day. The exact frequency of application will vary, based on how serious the pain is. Patients treating injuries may be told to use it for 2 weeks, whereas patients affected by rheumatic diseases may be instructed by their doctor to keep using it for 3 to 4 weeks. Algesal Suractive Pomad (Diethylamine Salicylate/Nopoxamine) might trigger discomfort or an irritated feeling affecting the area where it is applied. If these symptoms do not go away, your doctor may tell you to discontinue use of the ointment. Make sure that your doctor is told about any side effects that occur and get medical help straight away if any serious side effects are noticed. Do not ingest this ointment or use it on broken skin and sensitive areas of the body (such as the mucous membranes). It is only to be used externally, as directed by your doctor. Patients may be advised by their doctor to test the ointment on a small part of the skin, to ensure that it is tolerated and safe. Always use Algesal Suractive Pomad (Diethylamine Salicylate/Nopoxamine) as you have been prescribed by your doctor. Never self-medicate or change your dosage without first consulting your doctor. The correct dosage can vary depending on your health, medical history, and the severity of the condition being treated.